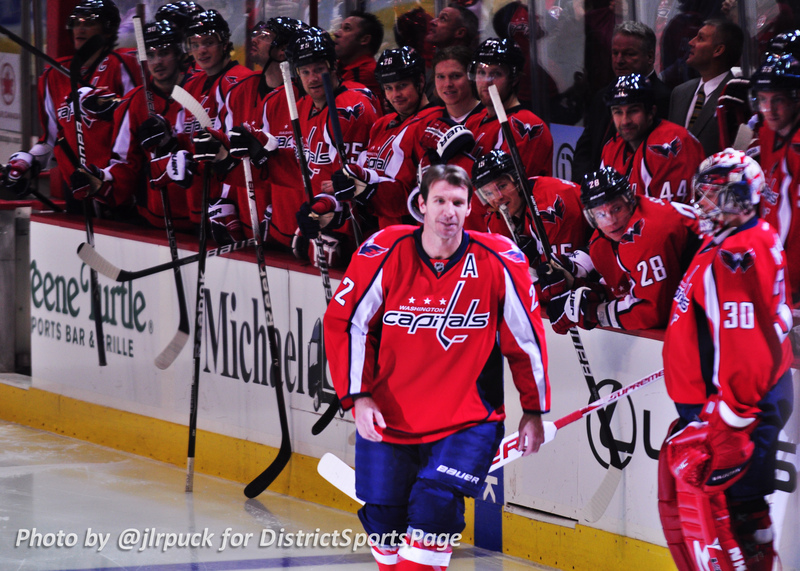 Washington Capitals Alternate Captain Mike Knuble played in this 1000th NHL game on Tuesday, Dec. 20, 2011 in front of the home crowd at Verizon Center against the Nashville Predators. It was a special night for Mike Knuble and his family. The Caps 4-1 victory was the icing on the cake. Knuble, 39 became the 269th player in NHL history to play in 1,000 career games and the fifth player to do so this season (Joe Thornton, Hal Gill, Dainius Zubrus, Vinny Prospal). Only 29 active players have played in 1,000 or more NHL games. Knuble has appeared in 999 career games with Detroit (62 games), the New York Rangers (141 games), Boston (307 games), Philadelphia (310 games) and Washington (179 games). He is one of just eight active players to have collected eight consecutive 20-goal seasons and his 24 goals scored last season were the third-most by a player 35 or older. One thousand games is a huge milestone in hockey and well deserving of pomp and circumstance. The Capitals put together a nice tribute and pre-game ceremony to honor the winger. Knuble mentioned in his pre-game interview that he many family members and friends in town for the game, including his high school coach. 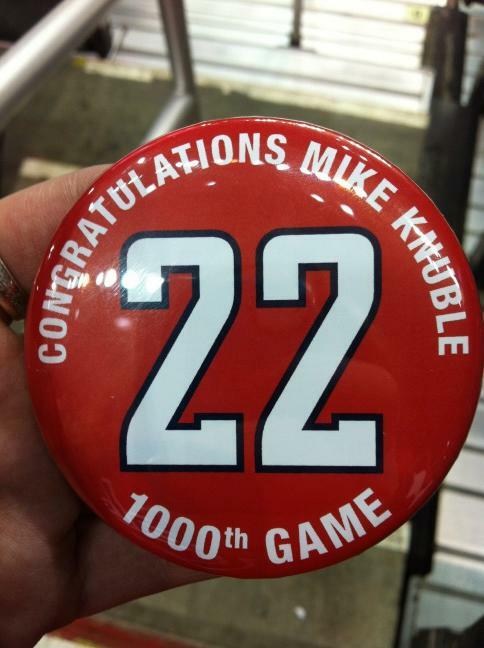 The evening kicked off by all fans in attendance receiving Mike Knuble commemorative buttons when they entered Verizon Center. The Capitals players themselves were even seen wearing these buttons after the game on their way to the private celebration. 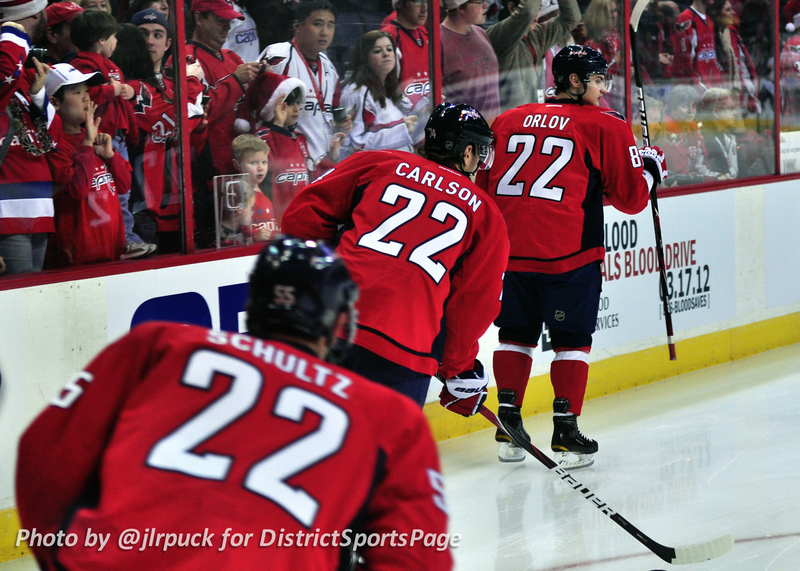 All of the Capitals players wore commemorative “Knuble” jerseys during the pregame warm-up, featuring number “22” on the back. 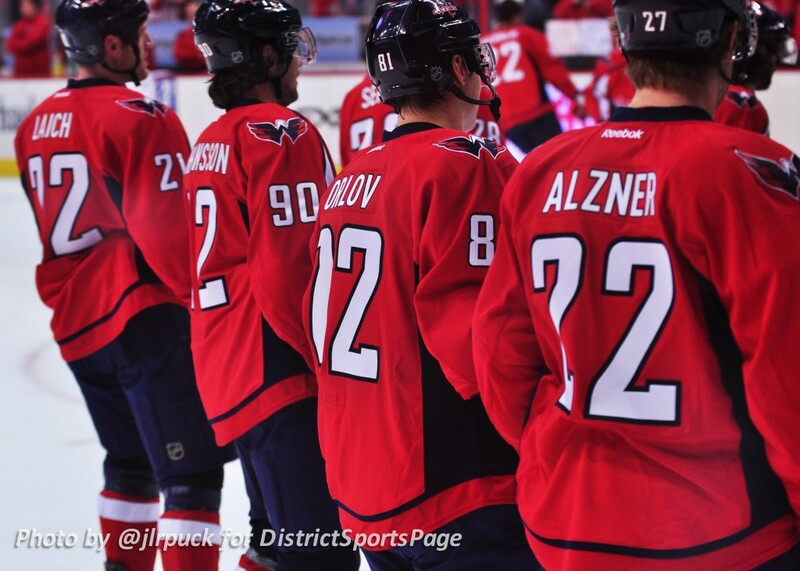 It is always a little strange to see an entire team wearing the same number, however, it is a nice gesture. The MeiGray authenticated jerseys were auctioned off during the game at the MeiGray auction table on the concourse outside of section 109. 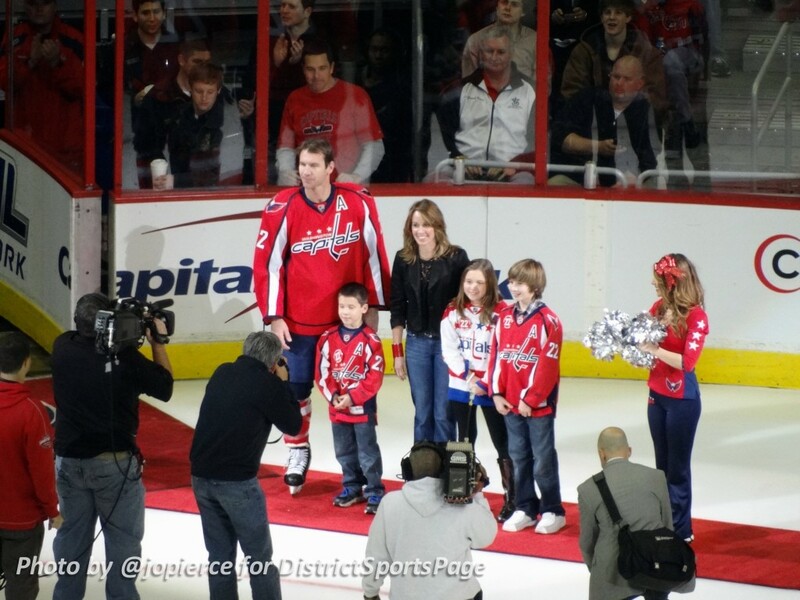 Knuble’s wife Megan, their daughter Anna and sons Cam and Cole joined Mike on the ice to honor Knuble. Both the NHL and Capitals organization presented Knuble with special gifts to commemorate his achievement. Knuble received a Tiffany crystal from NHL Senior Vice President of Hockey Operations Jim Gregory and a commemorative silver stick from Caps GM George McPhee. The Capitals players, represented on ice by team captain Alex Ovechkin and alternate captain Nicklas Backstrom, also made a surprise gift presentation – a Sea-Doo for the Knuble family. 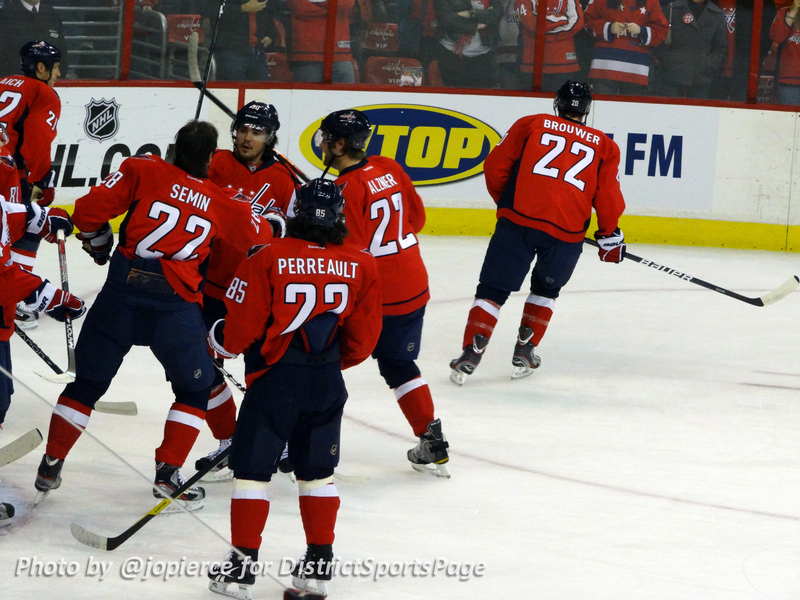 After the game, the Capitals got together for a private celebration. 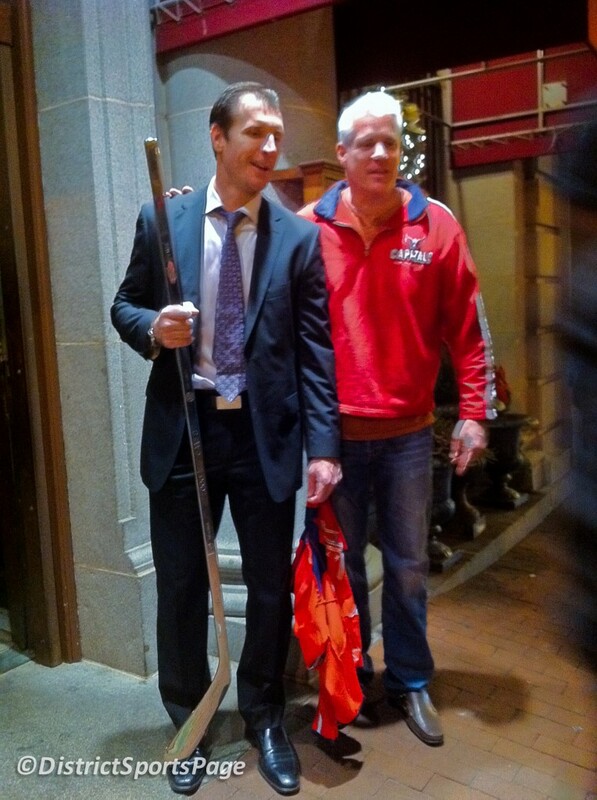 Knuble was spotted proudly carrying his silver stick to the party and a few fans stopped to ask if he’d pose for a photo, which he graciously obliged. Mike Knuble is a stand up, classy guy and Caps fans are clearly proud to have him as part of the team. 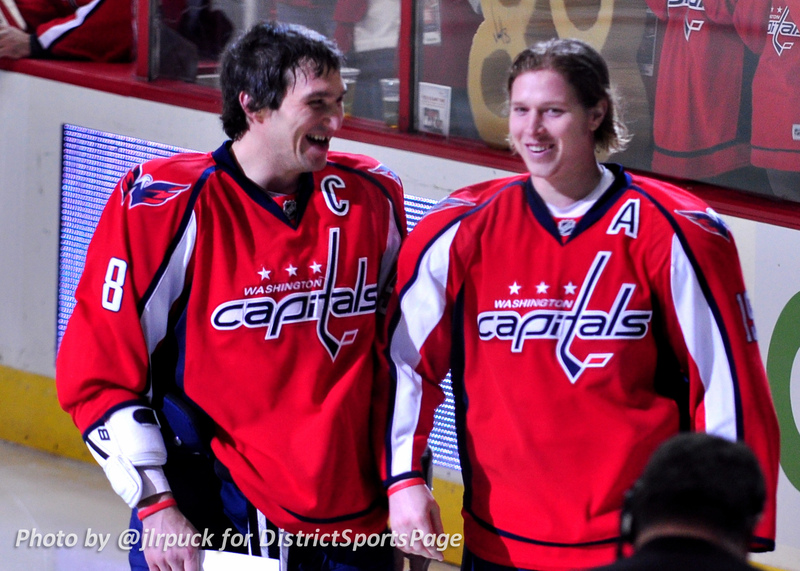 Knuble, a veteran of back-to-back Stanley Cup winners with Detroit in his first two years in the league, is one of two current Capitals to have won the Stanley Cup (Troy Brouwer). He has represented the United States in five international events, including the 2006 Winter Olympics in Torino, Italy. The 6’3”, 229-pound Knuble has scored more goals after turning 30 (221) than Wayne Gretzky scored in his 30’s (217). His 531 career points rank 49th among active players while his 271 goals rank 27th among active NHLers. 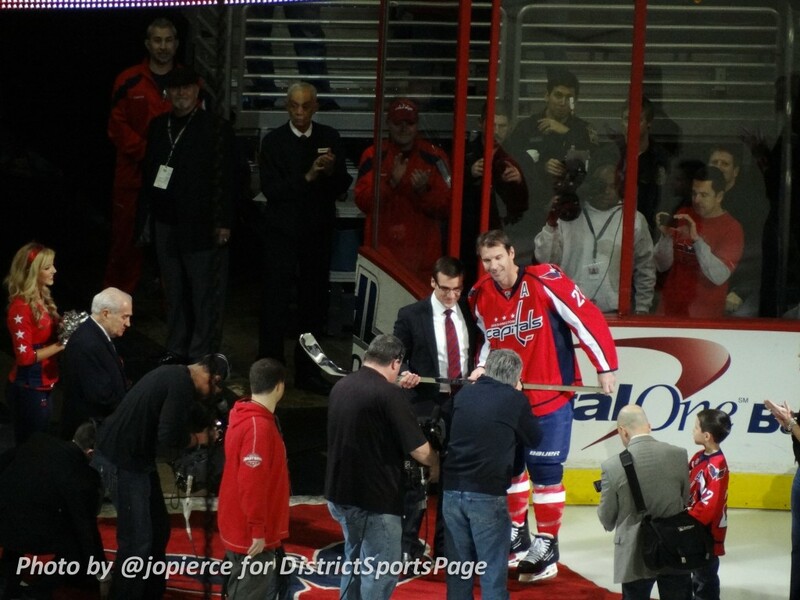 A special thanks to @jlrpuck and @jopierce for submitting their fantastic photos of warmups and pre-game ceremony. Mike Knuble 1000 Games Tribute: Fellow Caps congratulate Mike Knuble on making this milestone.